A photo collection documenting the Custer Expedition is now available online from the South Dakota State Historical Society. This year marks the 140th anniversary of the Custer Expedition to the Black Hills. From July 2-Aug. 30, 1874, the U.S. Army mounted an expedition, led by Lt. Col. George Armstrong Custer, from Fort Abraham Lincoln near present-day Mandan, N.D., to the then-uncharted region of the Black Hills in present-day South Dakota. The mission of the expedition was to find a suitable location for a fort in the area, to find a route to the southwest United States and to investigate the possibility of gold mining in the Black Hills. The entire 1874 expedition was photographed by English photographer William H. Illingworth, who was a photographer based in St. Paul, Minn. Illingworth had previously been the photographer on the 1866 Captain James L. Fisk expedition to Montana Territory. Illingworth was hired by Capt. William Ludlow at the rate of $30 per month to photograph images of the Black Hills and the members of the 7th Cavalry. 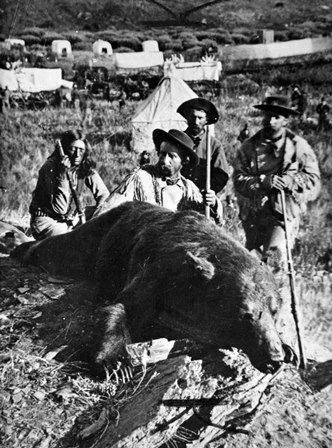 He produced approximately 70 photographic plates for the U.S. Army, including images of Custer’s wagon train, rock outcroppings, peaks and valleys, and Custer with his prize hunting trophy, a grizzly bear. Many of these images remain today with the South Dakota State Historical Society-Archives at the Cultural Heritage Center in Pierre. They can be found on the South Dakota Digital Archives, an online resource of over 50,000 digital photographic images and government and manuscript records from the archives holdings, at http://sddigitalarchives.contentdm.oclc.org/cdm/. Historical Society Foundation, the nonprofit fund-raising partner of the State Historical Society, at (605) 773-6001. State Archives staff is available to help assist with research and can be reached at (605) 773-3804 or archref@state.sd.us. Archives hours are 9 a.m.-4:30 p.m. CDT Monday-Friday and the first Saturday of each month. For more information, visit www.history.sd.gov/Archives.